Search Engine Optimization (SEO) is getting people who are using a search engine like Google to find your Website AND click on your website AND make the appointment. Search Engine Optimization (SEO) is all of the things that you need to do to get your website found by search engines. One of them is using meta tags to tell search engines your website is out there and what is on your website. Meta-tags are a hidden part of the site that search engines read. They help search engines decide how to list your website and where to list it. The search engines will show some part of the meta tags in the listing that search engines show for your website that will help determine whether or not people will click on the listing. Meta tags explain what you do and what solutions you provide. Since you only have a few lines of text that show, you will have to make it compelling to make people want to click on your listing. To help with the understanding of Meta tags, Keywords, Descriptions, and Headlines here is an actual page from my website to refer to as you read the descriptions below. Title Tag – The title tag tells search engines what is on your page. The title tag shows up in the top of the browser. It can also be the words in the first sentence of the listing that is created by the search engines, making it the center of attention. It is wise to make it compelling and should suggest something of value to potential visitors. It should create interest and make people want to investigate further by clicking to your page. It is also the words that appear when you go to bookmark a website in your browser. Your main keyword should be in the title and in the first few words. The title tag is very critical because it captures the attention of search engines and readers, so take time to craft it for each page. Unfortunately, if it is too long, it will be cut off in the listing. Keyword Tag. Your homepage will have the main keywords that you want to get found for. Each page on your website should focus on a main keyword. Enter one word if you want. It is more for you and keeping your content on track. Search engines don’t use it much anymore or so they say. I still put in in there just to help me stay focused on the topic. Your homepage and each page of your website should include this meta data. It should also be formatted in a way that includes keywords in the page in specific ways. Each page needs to have it’s own title and description. The page title should be the same as the name of the file – with the same words exactly as they are laid out. The page title will show in the top of the browser bar when someone is viewing the page. It will also show up as the title of the listing that the search engines provide. It is what people and search engines will read first so it needs to make them click on your site and not the next listing! Whatever program you use will require that you learn how it puts the title in – it is usually easy to do. Every program is different. A title is usually less than 70 characters. If you have more than that, the words will be cut off at the end. Your keywords list should restate the name of the file first (your main keyword for that page) and then add additional keywords that apply to the page and website. Use your main keyword only once! Use variations of it if you can. Be short and to the point! The description of the page will also start with the name of the file (that uses your main keywords) and can be in the form of a sentence. The description will be caught by search engines in the results. This is like writing an advertisement for your website so write it carefully. Don’t use the same words as in your title except for the keyword or keyword phrase. Make it catchy! Make people want to click and read your website! The headline of the page should also be the same as the file name of the page. Create a headline that is larger in text and uses the headline format (which is different depending on what program you use). It should also be descriptive to make people want to keep reading. Make it interesting! The first line of the text should include the file name in the page and the same keyword should be used a few times throughout the body of the page. 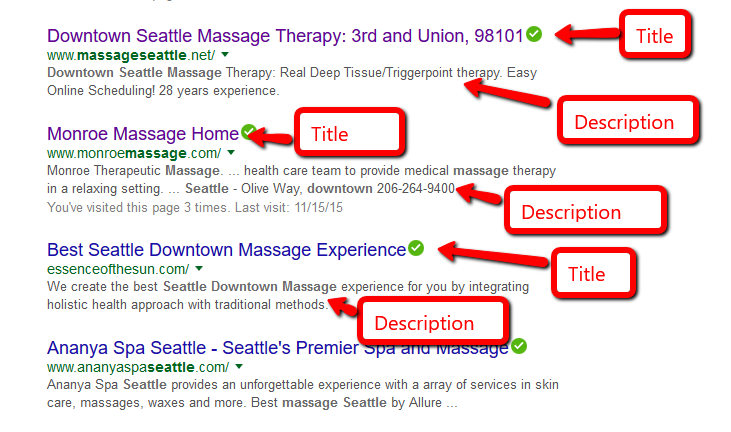 Name your photos –with the main keyword of the page as in seattlemassage.jpeg to further attract search engines, consider using an ‘alt tag’ for photos or graphics that also have the same keyword name. Here is what it looks like in a search result! There also seems to be a lot of controversy over the use of meta tags on websites especially since Google has said that they do not go by the keyword tag. The title tag and the description tag are still the things that do show up in the listing so until that changes just stay with it! You just add those codes to your website in the meta tag area. You will have to find out exactly where you can add those tags depending on the system you are using. Some systems may not let you add these additional tags but they can help for a local site to get listed in the search engines. All the above is just telling the search engines that you are here and what you are doing – that you are in Seattle doing massage. With each page you build, you will need to use a different main keyword. You can use a variation of your main keyword, for instance ‘massage therapy services’ for the services page or ‘your city massage services’. Use this same method for creating tags and for using the keywords of each page. Don’t over use words. You will need to keep building pages, finding new keywords and developing new content. I usually recommend 30 pages but more pages does not necessarily mean more traffic/clients. It is what is needed to really convey what you do and to build trust with potential readers. Don’t be alarmed by that number. I will have many ideas for topics. They will be built over time. You don’t have to be a perfect writer! It is really about writing down what you are already saying to people every day, either on the phone or to clients on your massage table. Just start writing the same way you talk to people. It is more appealing and more personal on websites. You are providing a service to the massage profession by educating clients as to what you do and what massage does. Content is what makes the internet and websites work. Just put yourself in your client’s shoes and assume they know nothing about their muscles and/or their body. The curse of knowledge is that we often forget what we already what we know. All this may seem to take a lot of time and energy. It does, but once it is done you can add a page or two a month if you want even more clients. I suggest starting with setting up 10 pages in the first month and then adding to it over the next few months. You can track your results and make changes as you go. So carefully crafted meta tags can help get your website found by the right people. See also Google’s Guidelines for Using Metatags.